Candleholder by Gunnar Ander for Ystad Metall. Year circa 1950. Iron and brass gong by Ystad Metal, Sweden, circa 1950. Rare pair candleholders from Ystad Metall. 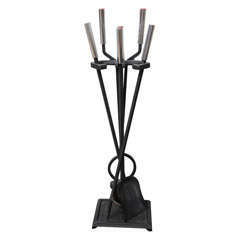 Candelabra by Gunnar Ander for Ystad Metall. Year circa 1950. Brass in very good vintage condition. 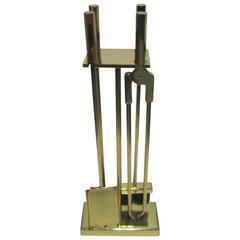 Brass and metal wire mesh fireplace screen Opened flat measures 51.5". 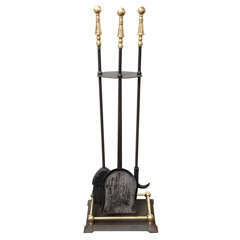 Fireplace tool set in black metal with chrome handles. Circa 1980. Includes five pieces: poker, shovel, brush, log holder and matching stand. 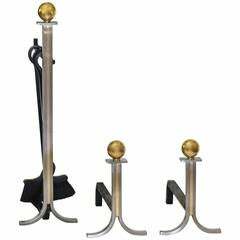 Classical modern black iron and chrome four piece set of fireplace tools and stand.